Today marks the first day of fall and I couldn't be more excited as its my favorite season to dress for. I became a little over eager this past weekend and switched out the summer tanks + cut offs in my closet for chunky knits + ankle boots. Too soon? 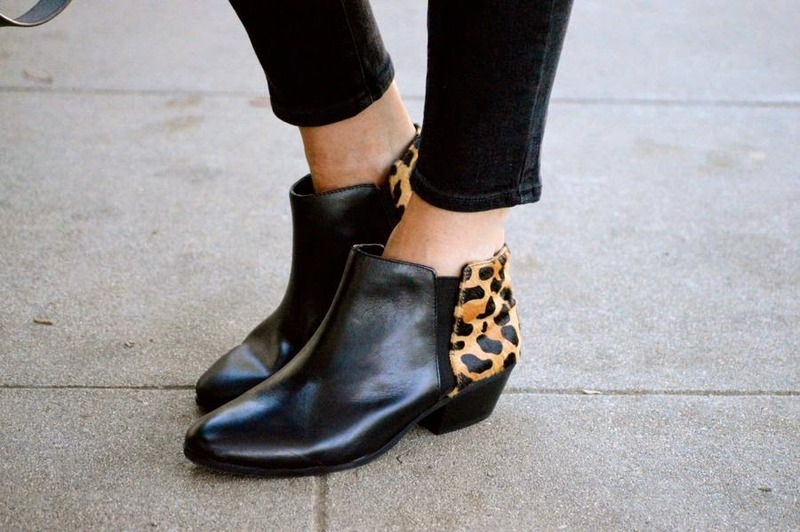 While organizing my closet I noticed I was missing a pair of flat ankle boots and immediately added these leopard ankle booties from Marshalls to my shoe game. Can we talk about how they were only $39.99? (Yes, really!) I was instantly drawn to the beautiful leopard detailing on the back and high quality leather. Want to know a secret? I've worn them every day since I took them home with me. (SHH!) What are you most excited for this fall? Those are too fun!! And I love your whole look. So perfect for the fall weather! (Now I just need some fall temps here :)). Love those booties, too cute! And that scarf is perfect! Fall is my favorite time of year too! I'm so excited for sweater and booties and scarves! Yay! I have to go to Marshalls to return a couple things and I really hope they still have those booties because I LOVE them! You look gorgeous!